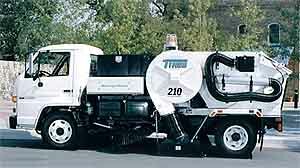 With a clearance as low as 6½-ft., the model 210 can be used for both indoor and outdoor sweeping applications. Pick-up head width of 78 in. TYMCO, Inc., P.O. Box 2368, Waco, TX 76703-2368. Tel: 254-7995546; Fax: 254-799-2722.